Copthorne Chapel is built on what was part of the old Copthorne Common in Snowhill, which is now part of the civil parish of Felbridge. At the turn of the 19th century there were no chapels or churches, within easy travelling distance, to serve this area of Felbridge, so when a group of evangelical Christians, under the leadership of Rev Trego arrived from the Countess of Huntingdon Church (now the Zion Baptist Church), in East Grinstead; they met with no opposition to setting up a chapel here. The gro up first met in 1822 in a barn in what became known as Chapel Lane, and continued to do so for the next few years . Five years after their first meeting the first stone of this new chapel was laid on 13th June 1827. The chapel was built within two months, at a cost of £300, and opened on 5th September 1827. The first sermon to be preached there was by Rev J Finchley. The chapel itself has a reinforced floor to take the weight of a portable baptism pool, and there was a pulpit and pews when it opened but these were destroyed by woodworm, along with the floor that had to be re-floored. The chapel was built in what was considered a remote position some half a mile from the nearest village centre and perhaps for this reason the chapel stands within its own graveyard. In 1848 the congregation had grown along with a Sunday School for the children. The chapel’s minister then was Rev Henry Rogers and his wife set up a trust fund, through her will some years later, to provide £5 a year to its upkeep. The Religious Census of 1851 shows the chapel as having a membership of 230. In 1860 the minister for the chapel was Rev George Vince who was also in charge of the Countess of Huntingdon Connexion chapels of West Hoathly, which had opened in 1824, and Turners Hill, which had opened in 1823, so he relied on lay-preachers to take the services in his absence. Copthorne Chapel continued to share its Ministers with West Hoathly until the retirement, in 1936, of the Rev W H Holt. The Band of Hope was started at the chapel in 1887 and soon became part of the community, with some 50 children and 10 adults joining, and by 1898 a photograph records a group of around 186 people. The growth in the membership appeared to have had some benefit for the chapel, and in 1890 a further room was added, with the foundation stone laid by a Miss Kensington. The chapel itself was then restored between 1896 and 1898, with new seats and facings being put in and the old brickwork replaced. The end of the 19th century and beginning of the 20th century saw the chapel at its peak, with a gradual decline in attendance during the second half of the 20th century. 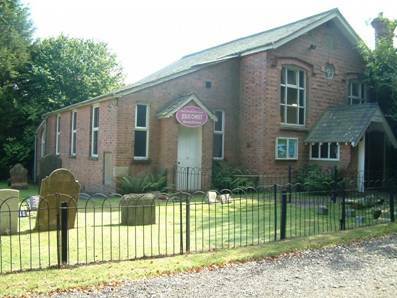 During the 1960’s the Copthorne Bank Free Church amalgamated with the chapel which has helped to maintain its survival into the 21st century. The fellowship is now around twenty..